Articles should be readable in order of publication. If a blog is posting a series of articles, reading the last post of the series before the first makes no sense. Keyboard shortcuts that are not only similar to Google Reader, but configurable to opt out of those that I don't want. Selecting a category should go straight into combined view, rather than showing me the article list, and then requiring me to select a first article. I've tried the Google Reader plugin for keyboard shortcuts, and I can't tell if it makes a difference. I expect it maps in some keyboard shortcuts that someone uses in Google Reader, but they're not the one's I use, and it works differently for me than Google Reader does. 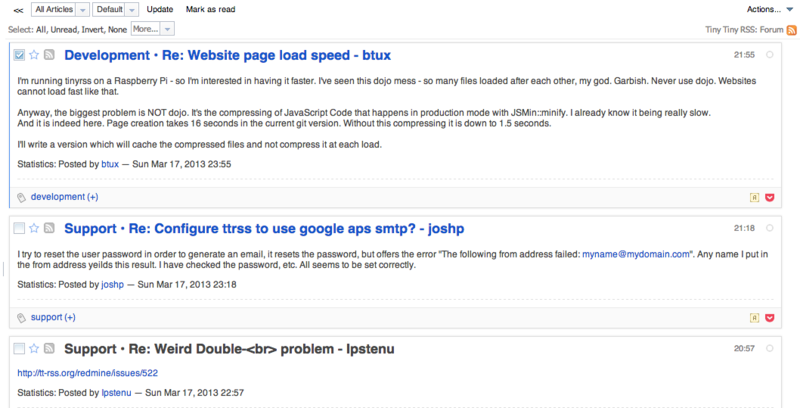 After some playing and some source code reading, I've come up with the following that get me pretty close to how I use Google Reader. As these persist in the database, they only need to be done once. In the main view, select "Unread" as the "show article" drop down setting. In the Preferences menu, turn on "Combined feed display". In the Preferences menu, turn on "Automatically expand articles in combined mode" (requires checking "Show additional preferences"). In the main view, press "f" then "x", to reverse the article sorting to be oldest to newest. I can do my own plugin for Google Reader keyboard shortcuts. Thanks for that. Looks very similar to Google Reader. to see the difference between read and unread. I've been trying to look this up, but I can't find this option. Can you please be more specific about the name of the checkbox? Last edited by Erhnam on 17 Mar 2013, 17:39, edited 1 time in total. 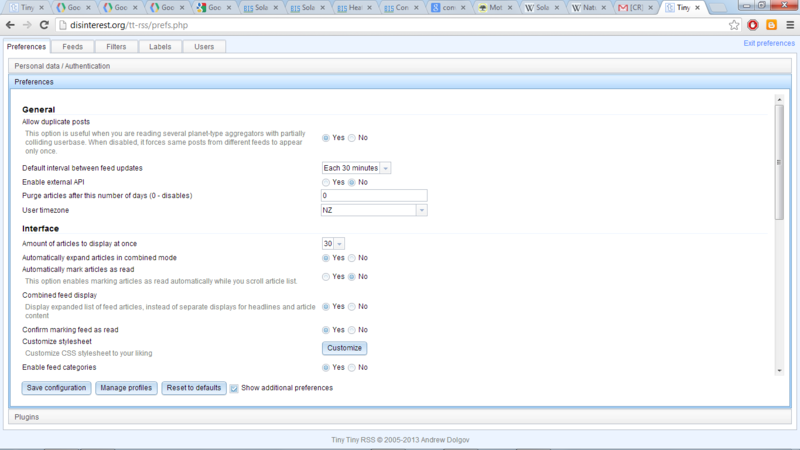 Enable additional options first (checkbox at the bottom), then you'll see it. Automatically expand articles in combined mode. Thanks for that. I've made some additional changes, to get the more subtle selected article white background with blue left hand side that Reader has. Also I override the default background color for odd or even entries (one or the other gets a grey background with default tt-rss css). rmtew wrote: Thanks for that. I've made some additional changes, to get the more subtle selected article white background with blue left hand side that Reader has. Also I override the default background color for odd or even entries (one or the other gets a grey background with default tt-rss css). I have actually done that, but based on the code from github. There we have the class "cdm" for every article. Ah, latest from github. Nice. I'll see what's involved in upgrading. Will this be made into a plugin? I would love to be able to use this as well. I've added the ability for plugins to add css blocks: https://github.com/gothfox/Tiny-Tiny-RS ... 1a2d09c1b6 so, technically, yes. Looks great, by the way. Nicely done theme.